Bulk email is a marketing message sent by a brand to multiple recipients at once. Its aim is to promote the business, sell goods, develop the relationships. After the registration in SendPulse, you can send bulk email absolutely for free. What should one look for when selecting a bulk email service? Today, marketers prefer to use bulk email services to deliver an important message without much effort. Unlike junk emails which are sent without the recipients’ permission, bulk emails are legal marketing campaigns since the recipients subscribe to receive them. However, if bulk email marketing is not properly managed, users may consider it spam, and consequently, it may hurt sender reputation. When creating and sending bulk email campaigns, remember to adhere to the CAN-SPAM Act to avoid penalties and losses to the business. Newsletters. A newsletter is a good way of keeping subscribers in the loop about what’s going on in a business. In most cases, they provide insights, notifications or guides to customers in a bid to help them understand a particular service or product better. Promotional emails. Bulk email is effective at promoting sales, attracting customers with offers and deals, and building brand awareness. These emails can also be used to suggest appropriate products to existing and prospective customers. Acquisition emails. These are messages sent with the goal of acquiring new customers and are typically directed at prospects on a list who are yet to convert. They may be used to share special offers to convince these potential customers to make a purchase. Retention emails. These mass emails are generally sent to existing clients to encourage them to keep purchasing from the company. They aim to boost a brand’s customer loyalty. Sending thousands or tens of thousands of messages to even just a couple of email addresses would be draining due to the amount of time and effort required. Moreover, the cost of running such a campaign would not be sustainable for any business. Using a bulk email service is cheaper, faster and much more convenient. A bulk email service is a company that allows its customers to send mass email messages to multiple lists of recipients at the time specified. With this service, one can send a single message to thousands of people on a list or a personalized email to each address on a list. A bulk email service can send emails to a list of any size. Most of these providers charge their offerings based on the number and frequency of the emails one wants to send. In SendPulse, users can send as many emails as they want to thousands of subscribers under different pricing plans. Sign up and get started right away. Getting labeled as spam or junk by the subscriber’s email client (for example, Gmail). Refusal of service by an Internet Service Provider or hosting company. Getting flagged by the Federation Trade Commission for breaking the CAN-SPAM Act and possibly paying a fine of a whopping $16,000 for every illegal email. Makes sure that the mass email campaign abides by the CAN-SPAM Act. Enables creating subscription forms to gather new subscribers. Lets users manage subscriptions and opt-out processes (adding and removing from mailing lists). Provides email templates that are mobile-friendly and editable. Prepares reports on marketing campaign performance. A brand, business, or website that has 2,500 subscribers or fewer can send bulk email using SendPulse for free. These marketing emails can amount to a maximum of 15,000 monthly. Take advantage of this offer by signing up! Follow the steps to send bulk emails at no charge with SendPulse. Register in SendPulse. To register, fill out personal details as requested on the registration form and submit by clicking on “Sign Up.” An account is automatically created, and with it, the user can create a marketing email campaign. Create a campaign. Select “Create a campaign” in your account and choose the necessary mailing lists for the campaign. Choose “Use segmentation” if grouping the addresses on the list is needed. Input a “Sender’s name” and “From” address (avoid using addresses from free email providers such as Gmail or Yahoo). Create an appealing subject line. Choose an email template. Select a suitable template for the campaign and personalize it. SendPulse offers 130+ adaptive email templates to choose from at no cost. After picking an email design, start the editing stage using the drag and drop editor. Users have the freedom to set parameters like color, font size, text style and content for the email. Apart from that, users can add images, videos, and buttons where necessary. Check and send the bulk email campaign. Go through all the details given to confirm that everything is as it should be, then preview the email to see how the recipient will view it. Lastly, send the bulk email or schedule the date and time for that. Monitor statistics. Do not forget to monitor how subscribers respond to the email campaign. These statistics are very useful for improving the campaign. Check reports to get data on opened and unopened emails, delivery errors, the number of recipients who unsubscribed, clicked the links, and so on. The simplest and most convenient solution to avoiding ending up in the spam folder is to use a professional email service. An email service provider takes care of all technical issues while the user concentrates on promotion and increasing brand awareness. However, for those who are handling their email marketing themselves, here are some tips to avoid ending up as spam and getting blacklisted. Avoid adding suspicious links or attachments. Links play a crucial role in determining sender reputation. So, if a link leads to a questionable site, it will most likely be blocked. The same case applies to documents and other attachments. If an email attachment has a shady title, download links to free hosting service or password protected archives, etc., the email will be marked as spam. To avoid these issues, don’t place any links in the subject line, don’t include shortened links, and only use a reputable file hosting service. Always have a plain-text email version. Though plain text email may be useful to only a small fraction of recipients, have it in the email to avoid being flagged by spam filters. Include a visible unsubscribe link. Not only is it a requirement under the CAN-SPAM Act, but it also allows recipients to unsubscribe from a brand’s emails instead of marking them as spam. Regardless of whether they are interesting or not, sending promotional or marketing emails every day can be irritating to the subscriber receiving them. Stick to once a week or at least once every month. Mind the email design. Fonts, text style, colors, and images can tell a lot about someone. When creating bulk email, be careful not to get these aspects wrong. Avoid things like uppercase writing, exclamation marks, too much media (images or videos), spelling mistakes, little text or wince-worthy language. Check your blacklist status and reputation regularly. The MXToolbox is very effective for checking whether an IP or domain is blacklisted. Just enter the domain or IP address that needs to be tested and click on “Blacklist Check.” If there is a green checkmark beside the list checked against, it means the server or IP has not been found on the list. Use double opt-in. Send subscription confirmation emails to new subscribers to verify that they have signed up for the brand’s emails. This process lowers unsubscribes, ensures that the addresses on the mailing list are correct, and eliminates spam complaints. Clean your mailing list regularly. If some subscribers no longer open or click emails sent to them and a reactivation campaign has failed to work, it is time to remove them from the mailing list. For this reason, regular mailing list clean-up is necessary. Delete such addresses to protect brand and server reputation. Use SPF and DKIM signatures. SPF, an email validation system, allows users to dictate which devices are permitted to send emails with the domain name as registered in DNS. The receiver can verify this information to ascertain the authenticity of an email. Having a DKIM signature is also helpful as it proves that a particular email was sent from an address of a particular domain. With this signature, a brand’s emails are more likely to end up in the recipient’s inbox. Here are three excellent examples of bulk email in use. 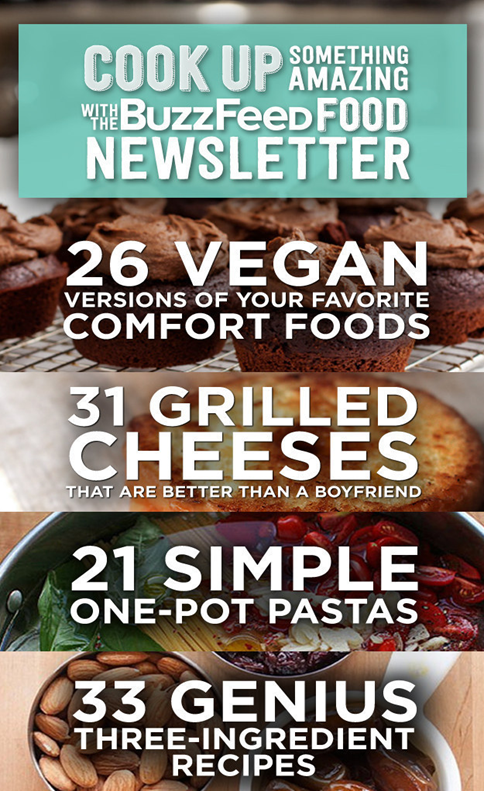 BuzzFeed food newsletter with visually-appealing headlines. 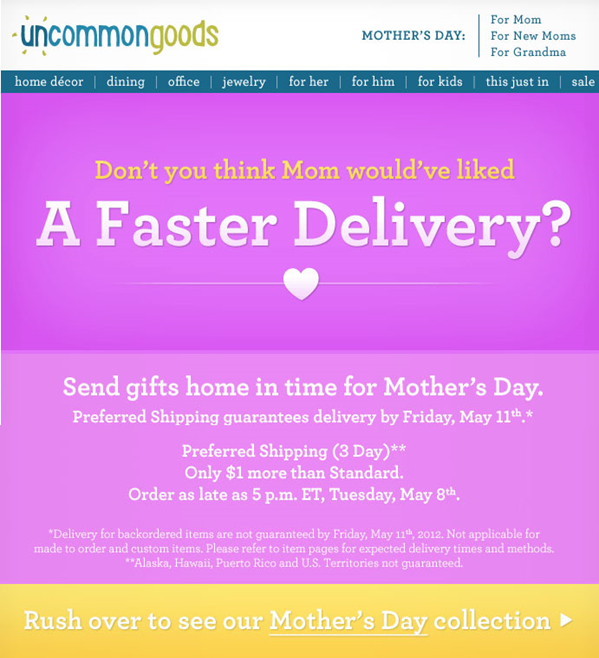 UncommonGoods bulk email newsletter showing how to sell a “sense of urgency”. 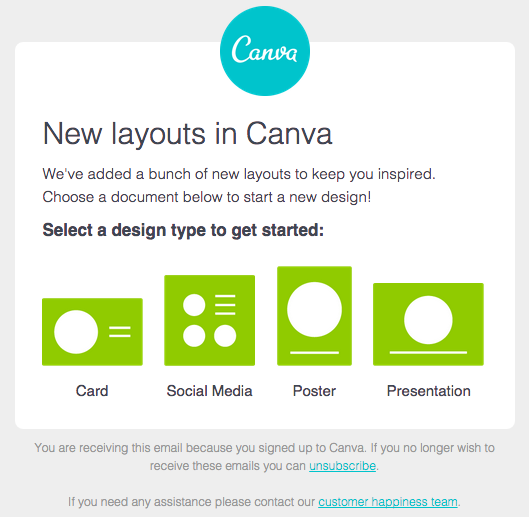 Canva simple but clear bulk email informing customers about a new addition to their offering. Create, send or automate bulk email campaigns easily and conveniently with SendPulse! Also searched with "Bulk email"
Rate this article about "Bulk email"
If you are interested in "Bulk email" you might be interested in our bulk email service.